Las Vegas Convention Center = power! Power is everywhere here at CES Las Vegas. 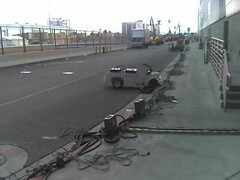 Here, the little carts that run workers around all over the place are charging up. This entry was posted in not yet categorized and tagged CES Las Vegas Power supplies. Bookmark the permalink.